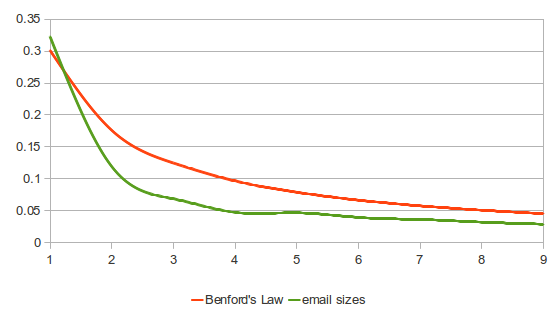 After reading Benford’s Law and email subjects at Yiorgos’ blog I was curious if the law stands for email sizes as well. Amazing, the law stands for sizes as well! Cool! The next thing to do is to verify whether the law stands with regards to INBOX sizes. On systems with email quotas I expect a distortion on the digit that defines the quota (or the previous one) unless the quota is too high compared to the general case of inbox size. I just wish we could get more Postmasters measure these things. Then maybe we could find a practical use of this observation. One thing that would be interesting, is if you have a huge mailserver (or a cluster of many of them), to do this per sender/block of senders. It may give you some idea on whether senders send spam. It cannot be useful in «real time». However, when one periodically reviews information, it may be indicative of persistent spammers and such information could be used to add score in SpamAssassin. I agree – it’s not useful in real time. And you need to know a bit more about the numbers involved before you can say a data-set that doesn’t follow the law is fake. The ages of my Facebook friends definitely don’t follow the law, but they’re all real friends. I might do something where I compare sets of ham and spam and see whether subject lines, length etc. follow Benford’s Law. How about the length of the email? Or even of the subject? The number of people sent to? The number of emails in a conversation. Once you start power law hunting you can see them everywhere. Επόμενο άρθροΕπόμενη It’s a girl! bilias στη It’s a girl! Sotiris Tsimbonis στη It’s a girl! kioan στη It’s a girl! kzorba στη It’s a girl! Security updates have been issued by Fedora (atomic-reactor and osbs-client), openSUSE (libqt5-qtbase, lxc, tar, wget, and xmltooling), Scientific Linux (java-1.8.0-openjdk and java-11-openjdk), SUSE (php5), and Ubuntu (znc). The LWN.net Weekly Edition for April 18, 2019 is available. Stable kernels 5.0.8, 4.19.35, 4.14.112, and 4.9.169 have been released. They all contain important fixes and users should upgrade. Security updates have been issued by CentOS (mod_auth_mellon), Debian (ghostscript and ruby2.3), openSUSE (dovecot22, gnuplot, and openwsman), Scientific Linux (mod_auth_mellon), SUSE (krb5, openexr, python3, and wget), and Ubuntu (firefox and openjdk-lts). Continuing with my preliminary exploration of Ghidra. If we continue with the call to RegOpenKeyExA from last time (yes, I know this code is unreachable as we discussed last time, but let&#x26;#39;s keep going anyway). If you ever heard me talk about DNS, you will know that I am a big fan of monitoring DNS queries, and I think DNS query logs are the best "band for the buck" log source to detect anomalous behavior. Everything that happens on your network, good or bad, tends to be reflected in DNS.